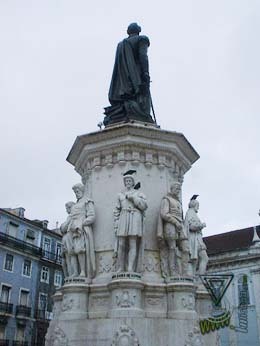 A bronze statue in the center of a Portuguese pavement composes Praça Luis de Camões. With this statue, Lisbon could see the birth of a beautiful urban square, but also an imperative sign of citizenship's modern concepts, embodied in the figure of an eternal hero-poet that died poor and alone. The author/sculptor of the monument that was constructed between 1860 and 1867 was Vitor Bastos. It was inaugurated, in a big ceremony and public participation, in 1867, being one of the great scale urban sculptures animating a traditional place. The square, urbanized in 1859 after the destruction and removal of the ruins of the Marialva and Loreto's marquis old Palace, just was completed with the collocation of the statue. The poet's figure arises, with a heroic and solitaire posture, made in bronze with 6 meters, in a stone pedestal with 7.5 meters, surrounded by statuary with some notable figures of our history (like Fernão Lopes and Zurara), pledged like Camões in the enlargement and the celebration of their native country, in each corner of its parallelepiped.